As a parent and a teacher, I understand both the need for students to provide a number of basic supplies and how those supplies can lead to better performance because students are organized and prepared for daily tasks. I also understand how some supply lists seem to want to break the bank. 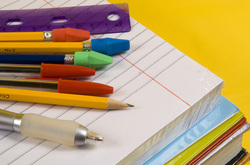 For sixth grade, our supplies are not as numerous as the previous grades, however, students will need to keep stocked up on certain items, such as pencils, pens, and paper. This year I have created a supply list on Classrooms by Walmart. You can find the list here. Please make notes of what is optional. Students will be allowed to carry backpacks to help keep their supplies together. Some items have been requested for classroom use and are 100% optional. And not all supplies need to be new, but they should be in safe working condition. If you have any questions about the supply list, feel free to contact me.